• What is the DiSC style of a group? • What are the advantages and disadvantages of the group culture? • How does the group culture affect members with different DiSC styles? • How does the group culture influence decision making? • How does it affect risk taking? • What types of behaviors are valued? What behaviors are not valued? Only by discussing these types of issues is it possible to capitalize on — or change — group culture. The DiSC Group Culture Report can be generated using data from DiSC Classic 1.0, DiSC Classic 2.0, 2 Plus, and DiSC PPSS on EPIC. No respondent names are included, which assures anonymity and a safe jumping-off point for further exploration. 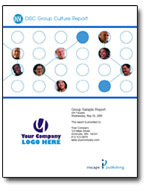 This report requires 25 EPIC Credits or can be purchased for $107.50. Large insurance company uses DiSC Classic 2.0 and Team View report to increase team effectiveness. DiSC Classic 2.0 validation and validity research report.